Keeping Metro Traffic Moving (KMTM) is a Government focus to tackle road congestion, keep traffic flowing and get you home sooner. KMTM focuses on making the best use of existing road and public transport assets through a mix of short to medium term, low-cost actions. Across Adelaide, a number of our most important road network routes are showing increased levels of congestion, with many signalised intersections either approaching or at capacity. Infrastructure Australia’s 2015 Australian Infrastructure Audit report suggests that the cost of delay on Adelaide’s urban transport network may continue to increase to be in the order of $4 billion by 2031. Along some key routes, traffic congestion is not only a problem for commuters during peak periods, but also for on-road public transport, businesses and freight traffic through-out the day. The Austroads Congestion and Reliability report considers the influence network operation and performance has on liveability and productivity of cities. The ability to provide efficient, reliable and safe movement of people and goods across Greater Adelaide is influenced by a number of factors including the provision of relevant information to road users, the management of roadworks and incidents, operation of level crossings, travel behaviours, balancing the needs of various road users, coordination of green traffic signals and the complexity and variability of our public transport system. 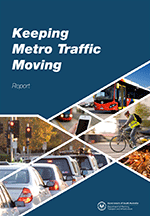 To download and view the full Keeping Metro Traffic Moving report please click here (PDF, 2280 KB). To view current and completed KMTM projects please click here. Implementation of identified actions within the KMTM report are ongoing and engagement on medium-term actions and on-going strategies aimed at smarter multi-modal management of the road space for improved performance into the future, will continue. Any recommendations identified as a part of this process are currently unfunded. Funding for any improvements will need to be considered against other state wide priorities in future financial years. This approach ensures that the funds available each year are allocated to the projects where the greatest benefit can be provided to the community as a whole.